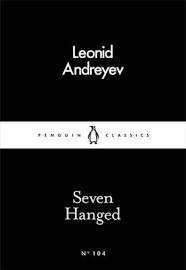 Although Penguin’s Little Black Classics series largely selects from previously published Penguin Classics, Seven Hanged is a new translation of Leonid Andreyev’s novella by Anthony Briggs. Its title neatly summarises the events described within – originally published in 1908, it gives us insight into the cruelty and repression which would lead to the Russian Revolution. Five of those sentenced to hang are ‘terrorists’, caught in the act of attempting to assassinate a government minister – but, whereas lesser writers may have focussed only on their story, Andreyev adds two ordinary criminals to the gallows. Seven Hanged in a tense, moving story which is strangely uplifting in moments. It suggests that Andreyev, a writer greatly neglected in English translation, deserves far more attention. It’s to be hoped that this might be the beginning of more of his work becoming available once again. Herman Melville’s Bartleby exists in a long gone world of scriveners and copyists, and yet there us something urgently contemporary in its scrutiny of the world of work. Before Bartleby joins the Wall Street offices of the narrator, a lawyer, we are introduced to the current staffing complement, Turkey, Nippers and Ginger Nut: “In truth they were nicknames, mutually conferred upon each other by my three clerks and were deemed expressive of their respective person or characters.” Encapsulated by nickname, the narrator is able to describe their particular, unchanging characteristics; while they are presented as completely known, Bartleby enters as the unknown. Problems occur when Bartleby is asked to proof-read his work with the other clerks. “I would prefer not to,” Bartleby replies, a standard response to any request which would take him outside the comfort of his screen. Bartleby’s passive resistance worsens when he refuses to even write, but the narrator finds himself helpless in the face of his indifferent refusals. 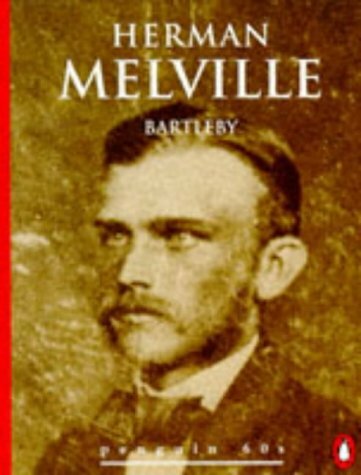 The story’s genius lies in Melville’s own refusal to offer any explanation for Bartleby’s behaviour (one can just imagine him telling his editor that he ‘prefers not to’). It can, of course, be read as Melville himself grappling with his writing, but I prefer to see it as resistance to the futility of work, the realisation that pointless copying is almost all we ever do, and also the liberation of that five-word phrase that frees us from the obligation. Most marvellous of all is a steel flea they gift to the Emperor, so small it appear only as speck, with a key to wind up its clockwork parts that can only be seen through a ‘nitroscope’. (Though the English gift the flea to Alexander, they charge him for the case to carry it in – Leskov aims his satirical barbs at whatever nation comes within range). “…by the time you come back you will have something worthy to be shown to his Imperial Splendour. In the story’s second half Lefty returns the flea to England to show off his work allowing Leskov to poke more fun at the cultural differences of the two nations. In fact, the whole story is genuinely amusing – and if that wasn’t enough Leskov indulges in some witty wordplay: military equipment such as “nautical whether-meters, gamble-hair coast for the infantry waterproof rein coats for the cavalry”; “prejudunce” instead of prejudice, and, my personal favourite, a “calumnist” from the “Daily Telegraft”. (Kudos to translator William Edgerton for ensuring that all remain amusing and are never intrusive). 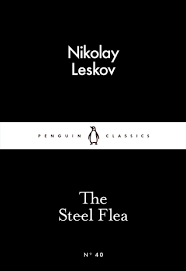 The Steel Flea is a wonderful introduction to Leskov (it reminded me a little of another writer I have come to love this year, Stanislaw Lem) and is highly recommended to anyone looking for some 19th century Russian humour – surely the bets kind? Note: this translation does not come from the Penguin Classics Lady Macbeth of Mtsenk and Other Stories or the Vintage Classics The Enchanted Wanderer and Other Stories but seems to originate from the 1969 Satirical Stories of Nikolai Leskov. 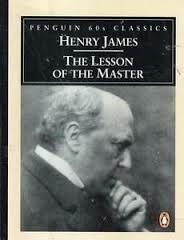 Although out-dated in its implication that only men can ever hope to attain the perfection of genius, Henry James’ The Lesson of the Master explores the still relevant tension between artistic achievement and ordinary life. As Cyril Connelly famously put it, “There is no more sombre enemy of good art than the pram in the hallway.” (Though as James’ work consists largely of people talking, one might think the greatest enemy was chat). By this point Overt has fallen in love with Miss Fancourt but St George convinces him that marriage will prevent him from achieving the perfection of his art that should be his aim. The story apparently has a twist at the end (look away now if you don’t want to know) though I feel it’s fairly easy to foresee: Overt leaves England to pursue his writing; St George’s wife dies and, when Overt returns, it is to discover St George and Miss Fancourt are engaged. Overt’s naivety continues to the end when he wonders: “Are you marrying Miss Fancourt to save me?” James’ concern that domesticity is antithetical to art is real, however, and behind the comedy lie some of the choices that any artist has to make. 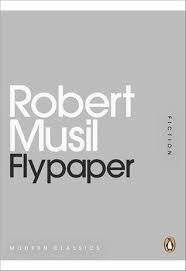 I have long desired to read Robert Musil’s The Man Without Qualities, but picking up such a long book often feels like moving in with someone you have yet to meet, so let’s look on Flypaper as a first date. (Should things get more serious I have a copy of The Confusions of Young Torless to hand). The pieces in Flypaper come from The Posthumous Papers of a Living Author, translated by Peter Wortman, and published by Archipelago Books rather than Penguin. Most are short pieces – two to six pages – with the exception of ‘The Blackbird’ which runs to almost thirty. A couple, however, are more ruminative essays, one on monuments and the way in which, built to be noticed, they lie instead in a background to which we are largely oblivious; another on what he calls paintspreaders, who he claims to bear the same relation to painters was penpushers do to poets. The final piece, ‘The Blackbird’, was the least satisfying to me. Partly told as a dialogue between two friends – rather bizarrely named Aone and Atwo – it presents some interesting ideas on friendship and also a wonderful scene set during war, but the puzzled reaction of one friend at the end – “But aren’t you implying…that all this is supposed to have a common thread?” – very much echoed my own. Overall, though, enough to meet again! 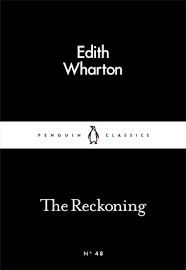 So begins Edith Wharton’s The Reckoning, a story which goes on to gleefully disabuse ‘the new dispensation’ which, I suppose, is largely how marriage is viewed now. In 1902, however, the idea that you might leave your wife or – God forbid! – your husband because you were tired of them is likely to have been little short of free love. (In fact when I began this story my initial impression was that the Westalls, Clement and Julia, did have an open marriage, when their radicalism only consists of allowing for divorce). It is Wharton’s skilful dissection of emotions throughout that gives the story depth. The same is true of the other story here, ‘Mrs Manstey’s View’, a slighter piece (apparently her first published story) but still able to convince in its portrayal of the last days of an elderly widow. Her brief backstory involves a disappointing love affair which ended when her sweetheart, Theodore, “to make sure of avoiding conscription…married a very rich old woman.” It is after this that she leaves the farm where she has been working for the town and finds herself (rather fortuitously) employed by Mme Aubain. Mme Aubain has lost her husband (and much of her fortune) and has two children, Virginie and Paul, to bring up. The two women, both abandoned, though in different ways, co-exist on companionable though never friendly terms. Felicite’s love for Paul and Virginie, however, is genuine. 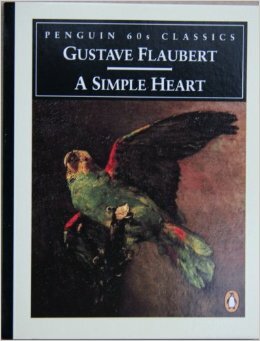 The parrot provides the story with its bathetic ending, one which suggests that Flaubert’s sympathy may be with Felicite but he has no wish to imitate her simplicity. One of the many positives of my daily stories this Christmas has been the (admittedly small) inroad it has made into my ignorance of Chinese literature. 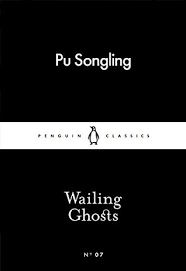 Having already had glimpses into the 19th and early 20th centuries, I now find myself in the 17th with a collection from Pu Songling’s Strange Tales from a Chinese Studio (in a 2006 translation by John Minford). As the title suggests these are short stories around three to five pages long, frequently featuring some aspect of the supernatural. In one of my favourites, ‘Stealing a Peach’, a man who claims “I can make the seasons go backwards and turn the order of nature upside down” is asked to produce a peach in winter. In order to do so he sends his son up a rope into heaven to steal one. The peach drops down from the sky but soon after the rope is cut and then the boy’s head falls to earth followed by the various parts of his dismembered body (lest we think these stories were for children). In the end it is a trick to dupe the watching mandarins out of money, but the man’s magic is never in question. While magic might raise my hackles in a contemporary novel, I found these tales, with their assumption that the natural and supernatural exist side by side, a liberating release from the strait-jacket of verisimilitude. There are fourteen in total in this brief volume, but, as Strange Tales from a Chinese Studio is over six hundred pages long, clearly many more exist to be enjoyed. In a moment of weakness (perhaps because Kate Chopin is a writer entirely new to me) I decided to seek out other interpretations of the short story A Pair of Silk Stockings only to encounter the idea that it is a critique of consumerism (which, if nothing else, would seem a little ahead of its time in 1896, although amusing considering it was published in the highly commercial Vogue magazine). In the story Mrs Sommers “one day found herself unexpectedly possessor of fifteen dollars,” and foregoing the items she originally intends to buy for her children, manages in the course of an afternoon to spend the sum entirely on herself. Is this symbolic of our desire for instant gratification as opposed to long-term responsibility? Perhaps, but a reading of the story which portrays Mrs Sommers as either a victim of seductive capitalism, or as a selfish and irresponsible mother seems deeply unsympathetic to me. The pair of silk stockings she buys for herself first are not an impulsive indulgence but a calculated cost (“And still there would be enough left for silk stockings”). After buying the stockings, however, she goes immediately to a fitting room and puts them on – “How good was the touch of the raw silk to her flesh!” – and only then her spending spree begins: new shoes, gloves, a meal in a restaurant and a visit to the theatre. When she wishes at the end that the “cable car wold never stop anywhere, but go on and on with her forever” it is because she knows her escape is ephemeral and she must return to the life she led before. 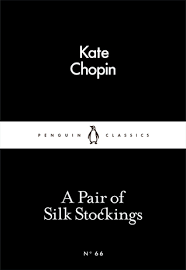 ‘A Pair of Silk Stockings’ comes with another four stories, all of which are excellent, and Chopin has been duly added to my list of writers to explore further. I first read Karen Blixen’s Out of Africa many years ago shortly before travelling to Kenya to live for a year. As I was reading it specifically as a book about the country (along with a number of others) this did not lead me to explore her fiction any further. 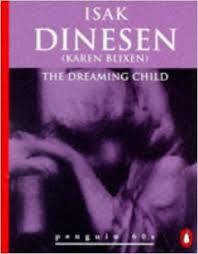 The Dreaming Child (and the other two stories included here, ‘The Sailor-boy’s Tale’ and ‘Peter and Rosa’) come from the collection she wrote after Out of Africa, Winter’s Tales, which was published in 1942 at the height of the Second World War under the pen-name Isak Dinesen. All three stories have a curiously old-fashioned feel to them – all are set in the 19th century and read as if written a hundred years earlier. The Dreaming Child remains enigmatic (i.e. vague) through to its conclusion, and, to be honest, it was my least favourite of the three tales included here. ‘The Sailor-boy’s Tale’ is a story which might have been written at almost any time, perhaps without the emotional resonance of the other two but neatly done. ‘Peter and Rosa’, however, succeeds on all levels, with both emotional depth and thrilling tension all the way to its desperate conclusion. Strangest of all, the stories do not read as ‘knowing’ or pastiche, even as, for example, Stevenson’s New Arabian Nights do, but as if Dinesen had written them a hundred years before.